YAY! Today is my turn on Donna Druchuna's Kitty Knits book tour! The whole schedule can be found here Please check out the other ladies' posts as they have put a lot of work into thinking of interview questions, and knitting projects. Adjustments: I didn't have Plymouth Yarn, but discovered some Patton's Marino I had was about the same guage from what I could tell. 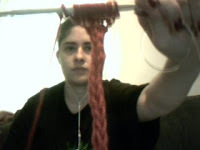 Also, I didn't have but one set of double pointed needles, and wasn't sure what size they were so I used a set of circulars after confirming we'd be knitting it flat and then seweing it up. Bobble. Never done one before. Also this is just my 2nd icord, though I fell in love with it and couldn't wait to use it more after the first time. This was also my first time felting! I inspect my icord tail. 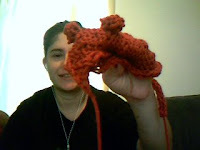 First mouse off the needles! Here the mice are post felting, pre stuffing... I swear we took a picture after stuffing but durn if I can find it. Tripsie lays down to sniff it. She only has 3 legs. While she runs pretty fast, she tends to plop down to rest pretty frequently. Kitty goes for a closer investigation (its hiding in the shadow of his head). Jadie I'm so proud of you. Your felted meese are so adorable. I'd want one, but my dog would just sniff it. Make a jingly ball mouse for Mr. Kitty. Next project: a life-sized felted Kangaroo. It's just a big meesie! Now that's pretty freakin' cool. :D How durable are those things, though? They're very durable. 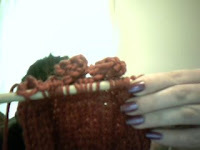 Just make sure to felt them so much that you can't see the stitches any more and they'll be almost indestructable. Tripsie looks happy! Great tour Jadie. I will have to try one this weekend for my babies.